Even the best laid plans can go awry…. a trip to the Ulster American Folk Park in Co Tyrone was planned. Son was very excited – this outdoor museum sounded right up his street. After a 2 hour drive to get there, we rocked up at the gates to find them well and truly locked. They close on Mondays – no matter this was the peak of the tourist season. Reminder to self, check details like opening times in future. My only saving grace, we weren’t the only people to make this faux pas – lots of other tourist vehicles turning at the gates made me feel slightly better. One sorely disappointed son and a wasted journey meant an alternative had to be found. These seemed thin on the ground in this location, but we spotted a forest park called Gortin Glen nearby and plumped for that. 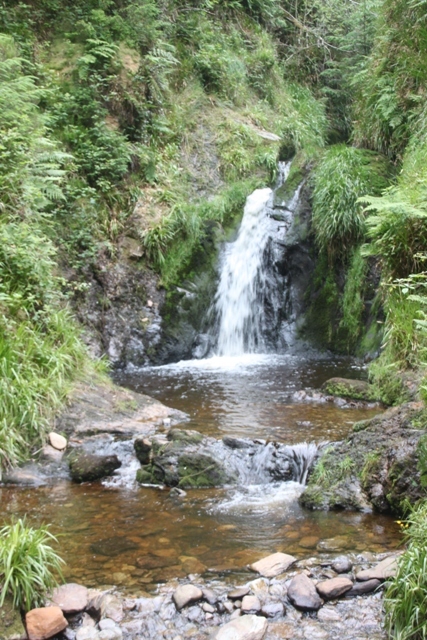 What a great find – this little gem, in the foothills of the Sperrin Mountains was beautiful. It was calm, peaceful and full of lovely hiking trails to explore. We set off on the nature trail, found some deer and other wildlife, then had our picnic. The afternoon was spent hiking the Ladies View Trail – only 3 miles but gorgeous. We followed Pollan Burn, a meandering stream, past a waterfall, up a fairly steep climb to a viewpoint. The trail criss-crossed the stream all the way up using quaint wooden bridges. We reached Mullaghcarn Summit and looked out over the hills. Son maintained the best part of this trail was that it was downhill all the way back to the car park. I have to admit, that was not a bad thing. We took the 5 mile scenic drive around the park afterwards, it promised stunning vistas but all we saw were trees. Nice trees though – Japanese larch and 45 year old spruce trees. The day hadn’t gone quite as planned, but the sense of space and solitude here plus the great trails made up for what we had missed at the museum. We decided to stop in Omagh, the next town, for coffee and cakes. While there, we had a look at the Peace Garden – a memorial to 29 people (plus unborn twins) killed in August 1998 when an IRA bomb exploded in the town centre. The garden is peaceful, quiet and a special place to sit and reflect. 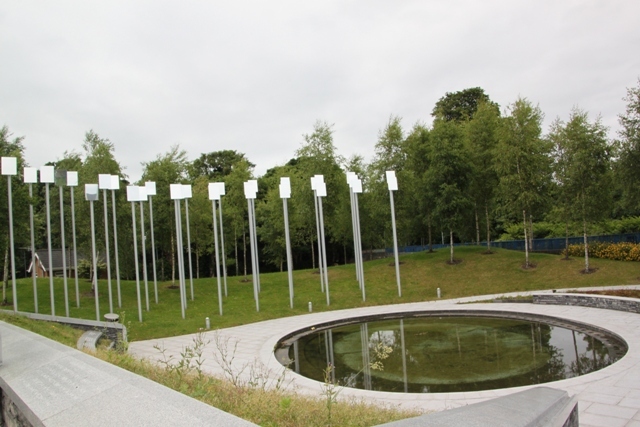 There are 31 tall posts with mirrors on top, representing the 31 people killed. A mirror tracks the sun and reflects it onto the top of the posts. Somehow then, the sunlight is carried to a glass sculpture containing a Tyrone Crystal heart. This glitters with the reflected light. The heart is not in the garden, but at the centre of the bomb sight. A special and beautiful memorial. Crossing the River Strule (anagram of Ulster), we headed back to the car, a different day to what was planned but no less special or enjoyable for all that. Looks like a beautiful place to hike, and although the memorial is a tragic remembrance, I admire how well it’s been done. Thank goodness it’s a safer place now. Yes, safer and much better thankfully! How beautiful is that waterfall? Ireland is so gorgeous! It might not be the most spectacular one ever, but yes, really beautiful nonetheless. I see you’ve been a lot around Ulster. Unfortunately I haven’t gotten the chance. I can’t seem to find this on your lovely blog, but have you ever been to the Giant’s Causeway? And what places would you recommend in Ulster? I’ve followed your blog! I grew up in Ulster and revisit as often as I can! Have been to the Giant’s Causeway many times, just not got around to blogging about it (unfortunately) but would highly recommend it. Also Carrick a Rede rope bridge, not too far away is a lovely spot. 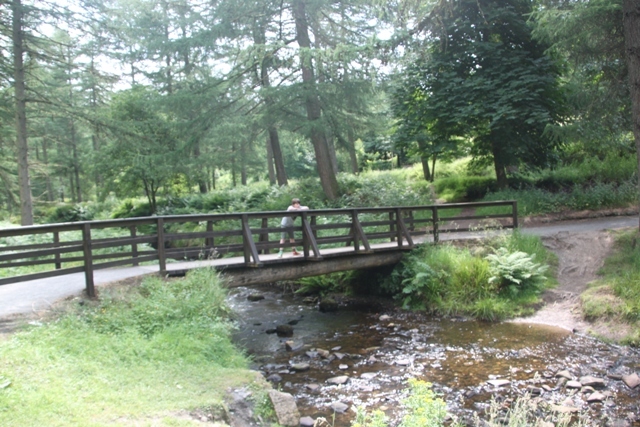 The Mourne Mountains are beautiful, Fermanagh lakes are peaceful and lovely and we love hiking in Glenariff Forest Park.